Experience: Serving as an International Community Scholar in Belize, funded by the National Science Foundation’s Research Experience for Undergraduates (NSF REU) program. 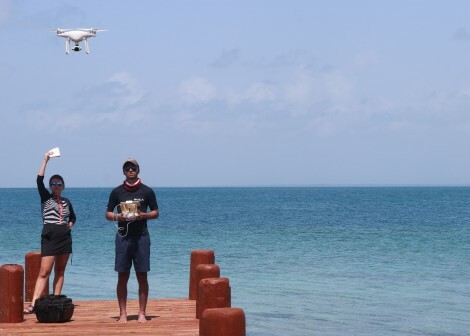 Farmer used drones to map the islands of Belize and conducted interviews with locals to provide context for a spatial storytelling aspect of his project. He presented his research at OWU’s Summer Science Research Symposium regarding environmental changes in Belize and how locals are adapting to those changes. He also has submitted his abstract and poster to present at the East Lakes Division of the American Association of Geographers. “I wanted to learn more about how the application of drones can heighten any kind of community GIS, participatory GIS, and remote-sensing projects. 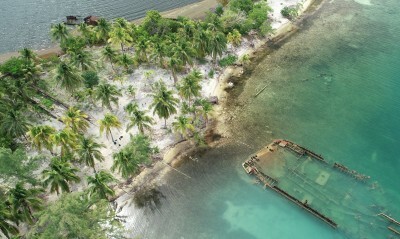 The project needed to be more than just drone mapping island, which brought my team to come up with the much-needed spatial storytelling aspect to the project. “Along with drone flying, we wanted to conduct interviews with locals on the islands and in coastal communities. This qualitative aspect of our research helped give context to our imagery and allowed us to develop a story for these islands and coastal communities. This story helped us reach conclusions and answer our research questions. “On our long weekend, two of my teammates and I volunteered to sacrifice our time to work with one of our community partners, Fragments of Hope (FOH). The entire day, honestly, was one of my favorites by far. It was amazing to see the restoration efforts they are doing to help reef system off the shore of Laughing Bird Caye National Park. “Prior to the REU, I had no drone flying experience but was able to pick it up fairly quickly. 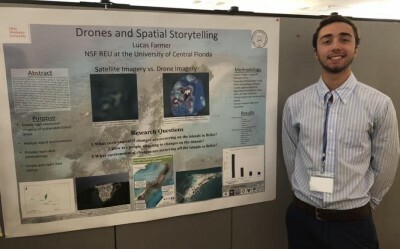 “After the REU, I have been able to apply what I’ve learned about drone operations, data organization, data processing, and ArcGIS to current course work and help the Geography Department run the RSL (Remote Sensing Lab). Such knowledge is very important to my future as I would like to be in the field utilizing drones for research or commercial use. Lucas Farmer ’19 presents the results of his research in Belize, which included drone mapping and interviews with locals to provide context for spatial storytelling (Photo by Adam Matthews/Western Michigan University).